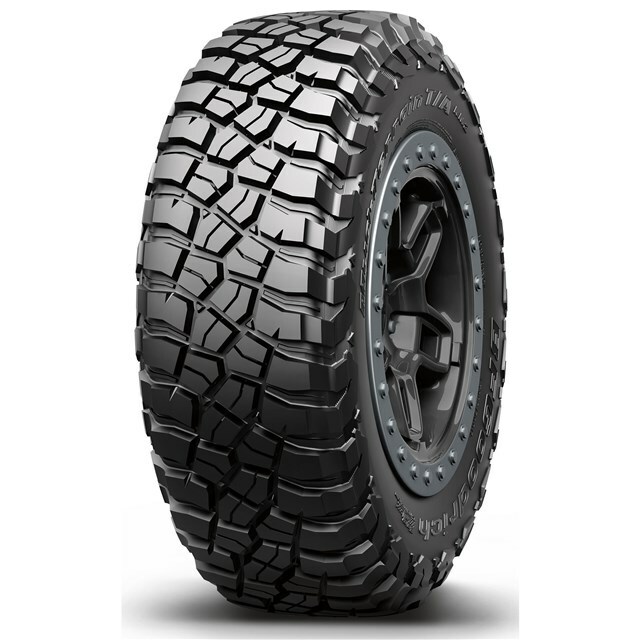 The Mud-Terrain T/AKM3 is BFGoodrich's Off-Road Maximum Traction tire, a category often referred to as mud tires, designed for the drivers of Jeeps, pickup trucks, full-size SUVs and dedicated off-road vehicles who want a tire that incorporates a long heritage of championship-winning technology in a street tire. Designed to overcome any obstacle that may get in the way and developed with toughness and traction at the forefront, the Mud-Terrain T/AKM3 also focuses on providing acceptable levels of on-road noise and comfort. The Krawl-Tek Compound of the Mud-Terrain T/AKM3 is designed to enhance grip on rock and slick surfaces and is molded into the symmetric, Terrain-Attack tread design. The large tread blocks provide a stable foundation in loose or rocky conditions and are oriented to provide biting edges in all directions for traction regardless of the angle of approach. The design of the Traction-Armor Sidewall Sculpture protects the tire off-road by helping prevent hazards from snagging and splitting the sidewall, while the notched shoulder design improves traction in dirt and mud. Stone bumpers in the tread grooves eject small rocks to prevent damage from drilling, and the mud-phobic bars in the shoulders help the tire self-clean to maintain traction in mud or soft soil. Wide grooves and lateral notches aid in hydroplaning resistance, and the independent tread blocks create biting edges for traction in wet or snowy conditions. The construction of the Mud-Terrain T/AKM3 is focused on toughness and durability, inside and out. Thick sidewall rubber and extended shoulder rubber provide resistance to splits, punctures and bruising, and the internal construction features a robust, three-ply polyester casing to further enhance puncture resistance. A single, nylon cap ply provides reinforcement, and two high-strength steel belts stabilize the tread. While Off-Road Maximum Traction tires are branded with the M+S symbol and able to churn through deep snow, their typical oversize applications and the absence of snow-biting sipes in their large smooth lugs can challenge their on-road wintertime traction on packed snow and icy surfaces.